Skip To (Decade). . .
January 28. Hugh Harman and Rudolf Ising, former animators for Walt Disney, sign with Leon Schlesinger, a manufacturer of silent film main title and dialogue cards. The animators begin producing Looney Tunes cartoons, which will be distributed to theaters by Schlesinger's friends the Warner brothers, whose movie studio bears their name. Harman and Ising begin hiring former Disney artists and animators, including Isadore "Friz" Freleng. May. Sinkin' In The Bathtub (Looney Tunes), directed by Harman and Ising and drawn by Freleng, debuts. The film stars Bosko and his girl, Honey. Lady Play Your Mandolin, the first of the Merrie Melodies series, debuts. Produced and directed by Rudolf Ising and drawn by Rollin Hamilton and Norm Blackburn, the cartoon features Foxy, who, at the end of the short, jumps from behind a drum and shouts, "So long, folks!" Harman and Ising leave Leon Schlesinger Productions and begin producing cartoons for rival MGM. Buddy, a new Looney Tunes character, is created by director Tom Palmer for the short Buddy's Day Out. January 13. Buddy The Gob (Looney Tunes), directed by Friz Freleng, animated by Jack King and Ben Clopton. Freleng receives his first on-screen credit as the "supervisor" of this short. February 17. Honeymoon Hotel is the first Merrie Melodies to be produced in color, directed by Earl Duvall, animated by Jack King and Frank Tipper. Looney Tunes cartoons will not be in color for another ten years. March 2. Porky Pig debuts in I Haven't Got A Hat (Merrie Melodies), directed by Friz Freleng, animated by Rollin Hamilton and Jack King. Porky, voiced by Joe Dougherty, displays his stutter during a torturous recitation of "The Midnight Ride of Paul Revere." Schlesinger hires Fred "Tex" Avery, a Dallas cartoonist who had been working for Walter Lantz, as a supervisor for Merrie Melodies. Chuck Jones and Bob Clampett are assigned to Avery's animation unit, which is housed in a dreary bungalow the animators call "Termite Terrace." January 11. The trademark Warner Bros. Animation "bull's-eye" makes its first appearance on I Wanna Play House (Merrie Melodies), directed by Friz Freleng, animated by Cal Dalton and Sandy Walker. Radio actor Mel Blanc and musical director Carl Stalling join the Warner Bros. animation team. Gold Diggers of '49 is the first Tex Avery Looney Tunes, animated by Chuck Jones and Bob Clampett, with appearances by Porky Pig, Beans, and Little Kitty. April 17. Daffy Duck explodes into cartoons in Porky's Duck Hunt (Looney Tunes), directed by Tex Avery, animated by Bob Clampett, Virgil Ross and Robert Cannon. July 17. Egghead Rides Again (Merrie Melodies), directed by Tex Avery. Egghead debuts in this cartoon. July 24. Clampett directs his first cartoon, Porky's Badtime Story, animated by Chuck Jones. Freleng leaves Warner Bros. to direct cartoons for MGM. He returns a little over a year later. September 24. Porky in Wackyland (Looney Tunes), directed by Bob Clampett, animated by Norm McCabe and I. Ellis. Porky chases the elusive Do-do Bird through Wackyland in this landmark short. November 19. Chuck Jones's first directing job, The Night Watchman (Merrie Melodies), is released. The story is by Tedd Pierce, animated by Ken Harris. May 20. Sniffles the mouse is introduced in Naughty but Mice (Merrie Melodies), directed by Chuck Jones, story by Rich Hogan, animated by Phil Monroe. May 18. The first attempt to merge animation with live action through an entire cartoon is made in the breakthrough film You Ought To Be In Pictures (Looney Tunes), directed by Friz Freleng, story by Jack Miller, animated by Herman Cohen. July 27. A Wild Hare (Merrie Melodies), directed by Tex Avery, story by Rich Hogan, animated by Virgil Ross. The cartoon is the first appearance of Bugs Bunny, who turns audiences into fans in this, his breakthrough role. March 15. Tortoise Beats Hare (Merrie Melodies), directed by Tex Avery, story by Dave Monahan, animated by Charles McKimson. Cecil Turtle debuts in this short, and along with his friends and family, pulls a fast one on Bugs. March 29. Goofy Groceries (Merrie Melodies), directed by Bob Clampett (his first color short), story by Melvin Millar, animated by Vive Risto. Super Guy (Merrie Melodies), send-up of the man of steel, makes an appearance months before the classic Max Fleisher Superman series finally debuts. Fifty-five years later, Superman would reappear in a Warner Bros. animated series for television. Tex Avery leaves the studio after he has a dispute with Schlesinger over cutting off the end of his film The Heckling Hare, which featured film history's longest fall and starred Bugs Bunny and the dog, Willoughby. Bob Clampett takes over Tex Avery's animation unit. March 14. Crazy Cruise, featuring a brief cameo by Bugs Bunny, is released. The short was begun by Tex Avery and was finished by Bob Clampett. March. Any Bonds Today?, directed by Bob Clampett, sponsored by the U.S. Government. Schlesinger rushed this two-minute short into theaters following the attack on Pearl Harbor three months earlier. The cartoon was a plea to theatergoers to buy war bonds. April 11. Horton Hatches The Egg (Merrie Melodies), based on the children's book by Theodore Geisel (Dr. Seuss), was directed by Bob Clampett and animated by Robert McKimson. Horton Hatches The Egg is the only Warner Bros. cartoon to be adapted from a book. July 11. Beaky Buzzard makes his screen debut alongside Bugs Bunny in Bugs Bunny Gets The Boid (Merrie Melodies), directed by Bob Clampett, story by Warren Foster, animated by Rod Scribner. October 3. The first color Looney Tunes is The Hep Cat, directed by Bob Clampett, story by Warren Foster, animated by Robert McKimson. November 21. "I tawt I taw a Puddy Tat!" is first used in A Tale of Two Kitties (Merrie Melodies). Directed by Bob Clampett and animated by Robert McKimson and Rod Scribner. January 16. Despite its blatant racial stereotyping, Coal Black and de Sebben Dwarfs is considered by many animation buffs to be one of the greatest cartoons of all time. This Merrie Melodies' lively, hilarious pacing and action was directed by Bob Clampett, story by Warren Foster, animated by Rod Scribner. Robert McKimson, under Bob Clampett's direction, redefines Bugs Bunny's "look" in the now-legendary model sheet, evolving the rabbit into the familiar character we know today. June. The first of twenty-six "Pvt. Snafu" cartoons is released, to be shown at U.S. military bases. Directed alternately by Chuck Jones, Friz Freleng, Bob Clampett, and Frank Tashlin, the cartoons depict the worst soldier in the Army, and offer funny lessons on what not to do to stay alive. Many of the scripts are written by Theodore Geisel (Dr. Seuss). September 18. Spoofing Disney's epic Fantasia, Schlesinger presents A Corny Concerto (Merrie Melodies), directed by Bob Clampett, story by Frank Tashlin, animated by Robert McKimson. Bugs Bunny, Elmer Fudd, Porky Pig, and a family of swans are featured in this witty parody. December 11. The last of the black-and-white Looney Tunes is Puss n' Booty, directed by Frank Tashlin, story by Warren Foster, animated by Cal Dalton. January 1. Little Red Riding Rabbit (Merrie Melodies), story by Michael Maltese, animated by Manuel Perez. In this Freleng short, Bugs is the rabbit that Little Red Riding Hood ("Hey, grandma! That's an awfully big nose for you ta have!") is bringing to dinner. Unfortunately, Grandma is "working the swing shift at Lockheed," leaving Bugs to mix it up with the big, bad wolf. Leon Schlesinger sells his interest in Looney Tunes and Merrie Melodies to Warner Bros. Jack Warner appoints Edward Selzer producer in charge of the animation department. February 26. Bugs Bunny And The Three Bears (Merrie Melodies), directed by Chuck Jones, story by Tedd Pierce, animated by Robert Cannon. Another classic fable takes a beating, this time at the hands of Bugs and the bears. August 19. Birdy and the Beast (Merrie Melodies), directed by Bob Clampett, story by Warren Foster, animated by Tom McKimson. Tweety becomes the main character for the first time while evading yet another hungry puddy tat. August 26. Buckaroo Bugs (Looney Tunes), directed by Bob Clampett, story by Lou Lilly, animated by Emmanuel Gould. Red Hot Ryder made his debut in this short, the first starring appearance of Bugs Bunny in a Looney Tunes cartoon. January 6. Pepé Le Pew, the over-amorous skunk, was introduced in Odor-able Kitty, a Looney Tunes short directed by Chuck Jones, story by Tedd Pierce, animated by Robert Cannon. January 13. Herr Meets Hare (Merrie Melodies), directed by Friz Freleng, story by Michael Maltese, animated by Gerry Chiniquy. Bugs Bunny takes on a Nazi officer, probably inspired by Herman Goering, in this wartime offering. March 24. The famished feline Sylvester makes his debut in Life With Feathers (Merrie Melodies), directed by Friz Freleng, story by Tedd Pierce, animated by Virgil Ross. Freleng is nominated for an Academy Award. May 5. Yosemite Sam blasts his way to stardom in Hare Trigger (Merrie Melodies), directed by Friz Freleng, story by Michael Maltese, animated by Manuel Perez, Ken Champin, Virgil Ross, and Gerry Chiniquy. This is the first Warner Bros. cartoon to give full credit to its creative team. Frank Tashlin leaves Warner Bros., and his animation unit is taken over by Robert McKimson. April 6. Robert McKimson's first outing as a director is the raucous Daffy Doodles, story by Warren Foster. Porky Pig is a police officer whose unenviable task is to catch Daffy Duck, the fiend responsible for painting mustaches on every poster in town. August 31. A supporting player steals the short in Wally Talky Hawky (Merrie Melodies), directed by Robert McKimson. Foghorn (ah-say) Foghorn Leghorn makes his debut here, in what was originally a Henery Hawk short. The giant rooster uses Henery Hawk's determination to catch a chicken as a means for tormenting the barnyard dog. Bob Clampett leaves Warner Bros., and his animation unit is taken over by Arthur Davis. November 9. Rhapsody Rabbit (Merrie Melodies), directed by Friz Freleng, story by Tedd Pierce and Michael Maltese, animated by Manuel Perez, Ken Champin, Virgil Ross, and Gerry Chiniquy. In another high point of his career, Bugs is a concert pianist trying to deliver a recital despite the mischief of a scene-stealing mouse. January 25. The Goofy Gophers (Looney Tunes), directed by Arthur Davis. Mac and Tosh, the insufferably polite gophers, make their debuts in this short, in which they try to outsmart a guard dog and ransack a vegetable garden. Bugs Bunny makes a cameo appearance. March 22. A Hare Grows in Manhattan (Merrie Melodies), directed by Friz Freleng, story by Michael Maltese and Tedd Pierce, animated by Virgil Ross, Gerry Chiniquy, Manuel Perez, and Ken Champin. Now an established star with a long string of hit cartoons, Bugs recounts his own "story," in which he grew up on the lower east side and outsmarted a pack of canine ruffians. May 3. Tweetie Pie features the debut of Tweety and Sylvester as a team in a Merrie Melodies directed by Friz Freleng. During production of this short, producer Edward Selzer orders Freleng to use a woodpecker from an earlier film instead of a canary; Freleng hands Selzer his pencil and quits. That night, Freleng is called at home and rehired by a conciliatory Selzer. When the short wins Warner Bros. Animation's first Academy Award the following March, Selzer accepts the statuette. November 1. Slick Hare (Merrie Melodies), directed by Friz Freleng, story by Michael Maltese and Tedd Pierce, animated by Virgil Ross, Gerry Chiniquy, Manuel Perez, and Ken Champin. One of several cartoons in which Bugs and Elmer co-star with caricatures of the era's greatest screen stars, including Humphrey Bogart, Gregory Peck, Frank Sinatra, Sydney Greenstreet, Carmen Miranda, and Lauren Bacall. January 3. Gorilla My Dreams (Looney Tunes), directed by Robert McKimson, story by Warren Foster, animated by Charles McKimson, Manny Gould, and John Carey. Gruesome Gorilla debuts as Bugs's unwilling foster father after the rabbit is "adopted" by Mrs. Gorilla. March 27. Back Alley Oproar (Merrie Melodies), directed by Friz Freleng, story by Michael Maltese and Tedd Pierce, animated by Gerry Chiniquy, Manuel Perez, Ken Champin, and Virgil Ross. A standout performance by Sylvester the Cat, who performs a series of moonlit arias, interrupting the sleep of a weary Elmer Fudd. April 10. Rabbit Punch (Merrie Melodies), directed by Chuck Jones, story by Tedd Pierce and Michael Maltese, animated by Phil Monroe, Ken Harris, Lloyd Vaughan, and Ben Washam. After heckling "the champ," Bugs finds himself in the boxing ring in this, the first of many "Bugs vs. an overwhelming opponent" shorts. May 8. Buccaneer Bunny (Looney Tunes), directed by Friz Freleng, story by Michael Maltese and Tedd Pierce, animated by Manuel Perez, Ken Champin, Virgil Ross, and Gerry Chiniquy. Yosemite Sam is transformed into a pirate in this outing, which sets the tone for subsequent Bugs vs. Sam shorts. July 24. "Surrender, Earthling!" 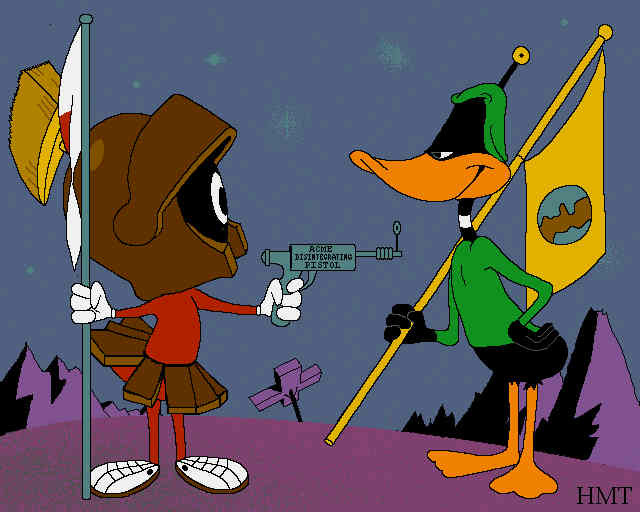 Clad in a tutu and a Roman helmet and armed with the dreaded "Illudium Pew 36 Space Modulator," Marvin The Martian (initially known as "Commander X-2") makes his debut in Haredevil Hare, a Looney Tunes directed by Chuck Jones, story by Michael Maltese, animated by Ben Washam, Lloyd Vaughan, Ken Harris, and Phil Monroe. September 16. Fast and Furry-ous introduces Road Runner and Wile E. Coyote. This Looney Tunes cartoon, directed by Chuck Jones, story by Michael Maltese, animated by Ken Harris, Phil Monroe, Lloyd Vaughan, and Ben Washam, establishes the formula for the duo's future vehicles: a series of unrelated blackouts in which the coyote (Carnivorous vulgaris) employs a variety of outlandish schemes and devices in his unsuccessful pursuit of his prey (Accelleratii incredibus). The pair become the center of one of Warner Bros.' most popular series of shorts for the next decade. November 12. For Scent-imental Reasons (Looney Tunes), directed by Chuck Jones, story by Michael Maltese, animated by Ben Washam, Ken Harris, Phil Monroe, and Lloyd Vaughan. This installment in the adventures of the love-struck Pepé Le Pew and the elusive feline object of his desire brings home Warner Bros. Animation's second Oscar. December 24. Rabbit Hood (Merrie Melodies), directed by Chuck Jones, story by Michael Maltese, animated by Ken Harris, Phil Monroe, Ben Washam, and Lloyd Vaughan. In a clip from his most famous film, Errol Flynn makes a cameo as Bugs outsmarts the Sheriff of Nottingham. In exchange for the right to use his image, a flattered Flynn requests only a copy of the cartoon for his collection. December 25. Leon Schlesinger dies. March 4. The Scarlet Pumpernickel (Looney Tunes), directed by Chuck Jones, story by Michael Maltese, animated by Phil Monroe, Ben Washam, Lloyd Vaughan, and Ken Harris. One of Daffy Duck's signature films co-stars many of the studio's most famous characters, including Sylvester the Cat, Porky Pig, Mama Bear, Henery Hawk, and Elmer Fudd. Chuck Jones wins his second Oscar for So Much For So Little, an educational film released in theaters, promoting the U.S. Public Health Service. October 7. Granny makes her debut as Tweety's doting owner in Canary Row (Merrie Melodies), directed by Friz Freleng, story by Tedd Pierce, animated by Art Davis, Ken Champin, Virgil Ross, Emery Hawkings, and Gerry Chiniquy. October 28. Pop 'Im Pop!, a Looney Tunes directed by Robert McKimson. Sylvester Jr. debuts as Sylvester the Cat's anguished son, who laments the fact that Dad can't fight a giant mouse (who, unbeknownst to them, is actually Gracie, the Fighting Kangaroo). December 16. Rabbit of Seville (Looney Tunes), directed by Chuck Jones, story by Michael Maltese. Bugs Bunny's and Elmer Fudd's takes on Rossini's famous Il Barbiere Di Siviglia is a Jones classic. March 10. Bunny Hugged (Merrie Melodies), directed by Chuck Jones, story by Michael Maltese, animated by Ken Harris, Phil Monroe, Ben Washam, and Lloyd Vaughan. Bugs, the mascot of "Ravishing Ronald," finds himself in the wrestling ring after his fighter is quickly dispatched by "The Crusher." May 19. Rabbit Fire (Looney Tunes), directed by Chuck Jones, story by Michael Maltese, animated by Lloyd Vaughan, Ken Harris, Phil Monroe, and Ben Washam. The first of an unintentional cartoon trilogy in which Bugs and Daffy argue over whether it's really Duck Season or Rabbit Season. Fortunately for them, it turns out to be Elmer Season. With Maltese's wit and wordplay, and Jones's extraordinary direction, the three cartoons take the characters to a new level of sophistication. The short also establishes Daffy as a character with as many psychological shadings as Bugs. Dwindling budgets and the influence of the style of UPA (United Productions of America), an independent studio, change the look of the Warner Bros. cartoons. The shorts, while still maintaining their comedic snap and satirical vigor, begin to feature dramatically stylized backgrounds, a trademark of UPA cartoons. January 19. Operation: Rabbit (Looney Tunes), directed by Chuck Jones, story by Michael Maltese, animated by Lloyd Vaughan, Ben Washam, Ken Harris, and Phil Monroe. Wile E. Coyote, now a "super genius," matches wits with Bugs Bunny for the first time in this cartoon. February 2. 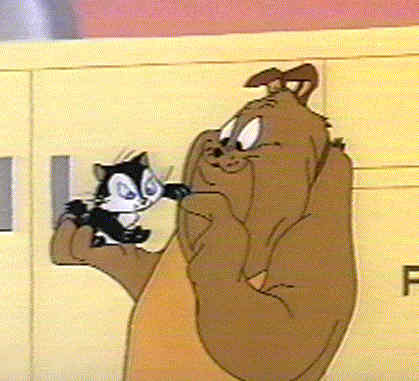 Pussyfoot, the adorable kitten who attaches herself to Marc Antony the bulldog, is featured in Feed the Kitty (Merrie Melodies), directed by Chuck Jones, story by Michael Maltese, animated by Ken Harris, Phil Monroe, Lloyd Vaughan, and Ben Washam. September 20. Rabbit Seasoning (Merrie Melodies), directed by Chuck Jones, story by Michael Maltese, animated by Ben Washam, Lloyd Vaughan, and Ken Harris. The second of Jones's three "Rabbit Season/Duck Season" shorts. This one ends with what would become Daffy's catchphrase: "You're despicable!" November 15. Pete Puma makes his first appearance a memorable one in Rabbit's Kin (Merrie Melodies), directed by Robert McKimson, story by Tedd Pierce, animated by Charles McKimson, Herman Cohen, Rod Scribner, and Phil De Lara. January 3. Ralph Wolf and Sam the Sheepdog are introduced as clock-punching adversaries who put in a full day's work around a flock of sheep in Don't Give Up The Sheep (Looney Tunes), directed by Chuck Jones, story by Michael Maltese, animated by Ken Harris, Ben Washam, and Lloyd Vaughan. February 28. Duck Amuck (Merrie Melodies), directed by Chuck Jones, story by Michael Maltese, animated by Ken Harris, Ben Washam, and Lloyd Vaughan. Daffy Duck meets his maker, an off-screen, unseen animator who torments the duck by constantly redrawing his backgrounds and, finally, Daffy himself. July 25. Duck Dodgers in the 24 1/2th Century (Merrie Melodies), directed by Chuck Jones, story by Michael Maltese, animated by Ben Washam, Lloyd Vaughan, and Ken Harris. One of Daffy's greatest outings, this one co-stars Porky Pig (as the Eager Young Space Cadet), and Marvin the Martian in a race to discover a new source for Illudium Phosdex (the shaving cream atom). August 29. Speedy Gonzales, "the fastest mouse in all of Mexico," tears across the screen in Cat-Tails for Two, a Merrie Melodies directed by Robert McKimson, story by Tedd Pierce, animated by Rod Scribner, Phil De Lara, Charles McKimson, and Herman Cohen. October 3. Duck! Rabbit, Duck!, a Merrie Melodies directed by Chuck Jones, story by Michael Maltese, animated by Ken Harris, Ben Washam, Lloyd Vaughan, Richard Thompson, and Abe Levitow. The third of the "Rabbit Season/Duck Season" trilogy. This time, it turns out to be Baseball Season, sending Elmer on a hunt for baseballs. March 13. Bugs and Thugs (Looney Tunes), directed by Friz Freleng, story by Warren Foster, animated by Manuel Perez, Ken Champin, Virgil Ross, and Art Davis. Mugsy, one of a pair of 1930s-style gangsters, makes his debut in this piece, in which they kidnap Bugs. Rocky appears first in 1950's Golden Yeggs. In the end, though, it's the rabbit who ends up taking them for a ride. June 19. The twirling, chomping, growling Tasmanian Devil debuts in Devil May Hare (Looney Tunes), directed by Robert McKimson, story by Sid Marcus, animated by Herman Cohen, Rod Scribner, Phil De Lara, and Charles McKimson. July 24. The bedeviling Witch Hazel is introduced in Bewitched Bunny (Looney Tunes), directed by Chuck Jones, story by Michael Maltese, animated by Lloyd Vaughan, Ken Harris, and Ben Washam. December 18. Baby Buggy Bunny (Merrie Melodies), directed by Chuck Jones, story by Michael Maltese, animated by Abe Levitow, Ken Harris, and Ben Washam. Baby Faced Finster (alias Ant Hill Harry), makes a memorable appearance as a bank robber who nearly gets the best of Bugs. September 17. Freleng wins his second Oscar for Speedy Gonzales (Merrie Melodies), with story by Warren Foster, animated by Gerry Chiniquy, Ted Bonnicksen, and Art Davis. December 31. One Froggy Evening (Merrie Melodies), directed by Chuck Jones, story by Michael Maltese, animated by Abe Levitow, Richard Thompson, Ken Harris, and Ben Washam. 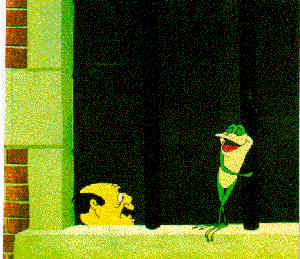 Michigan J. Frog's appearance in this short is so memorable that nearly forty years later he would become the mascot for the Warner Bros. Television Network. His rendition of "Hello My Ragtime Gal" is one of the most recognizable tunes in film history. The Warner animation team from Hollywood moves to new studios on the Warner Bros. Burbank lot. May 5. Gee Whiz-z-z-z-z-z-z (Looney Tunes), directed by Chuck Jones, story by Michael Maltese, animated by Abe Levitow, Ben Washam, Richard Thompson, and Ken Harris. The short features such classic gags as the "Acme Bat-man Outfit" and a painting of a bridge that's an actual bridge for Road Runner, but merely a painting for the Coyote. In a move that would introduce Warner Bros. cartoons to a new generation and insure their permanent place in American culture, the company sells all pre-1948 color cartoons to Associated Artists Productions (AAP) for TV syndication. Bugs Bunny, Daffy Duck, and friends become an after-school staple for millions of American children. January 5. Three Little Bops (Looney Tunes), directed by Friz Freleng, story by Warren Foster, narrated by Stan Freberg. The story of the Three Little Pigs is retold in modern jazz in one of Freleng's best. July 6. What's Opera, Doc?, a Merrie Melodies directed by Chuck Jones, story by Michael Maltese, animated by Ken Harris, Abe Levitow, and Richard Thompson. Jones's crew, along with musical director Milt Franklyn, bend and compress Wagner's Ring cycle into a seven-minute classic. In 1992, the short is inducted by Congress into the National Film Registry as a bona fide film classic, one of a handful of cartoons to be awarded the honor. August 10. Birds Anonymous (Merrie Melodies), directed by Friz Freleng. Sylvester becomes the first Hollywood star to turn himself in to a twelve-step program in this cartoon, which won Freleng his third Academy Award. Edward Selzer, executive producer of the cartoon division since the studio was bought from Leon Schlesinger, retires and is replaced by John Burton. August 23. When Bugs rescued the "Singing Sword" from The Black Knight (Yosemite Sam) in Looney Tunes' Knighty Knight Bugs, he also captured his first Oscar (the fourth for Freleng). January 10. Baton Bunny (Looney Tunes), directed by Chuck Jones, story by Michael Maltese, animated by Ken Harris, Richard Thompson, and Ben Washam. Bugs leads the orchestra through Franz von Suppe's Morning, Noon, and Night in Vienna and single-handedly plays the roles of cowboys, Indians, and cavalry. Arthur Q. Bryan, the voice of Elmer Fudd, dies. Cartoon Division Executive Producer John Burton leaves Warner Bros. David DePatie steps in as studio leader. October 1. "The Bugs Bunny Show" debuts on ABC in prime time. After it's moved to its now-familiar Saturday morning slot in 1962, it becomes the longest-running Saturday morning children's show in television history. December 3. High Note (Looney Tunes), directed by Chuck Jones. A drunken musical note is the star of this short, which didn't contain a word of dialogue. The film garners an Academy Award nomination for Jones. Film attendance, and with it the demand for theatrical cartoons, drops as television strengthens its foothold in American homes. August 1. Senorella and the Glass Huarache, a Looney Tunes short directed by Hawley Pratt, story by John Dunn, animated by Gerry Chiniquy, Virgil Ross, Bob Matz, and Lee Halpern, is released. This will be last theatrical short from the classic studio until 1987. Friz Freleng and David DePatie lease Warners' cartoon plant and establish DePatie-Freleng Enterprises Inc. They make 37 cartoons under the Warner Bros. shield. The success of DePatie-Freleng gets Jack Warner's attention, and he reopens the cartoon studio off the Warner lot. Warner Bros. discontinues distribution of all short subjects, and the revived studio is, for the time being, closed. As renewed interest in the old cartoons grows, screenings and tributes are held worldwide. "The Boys from Termite Terrace," a documentary by John Canemaker about the old cartoon studio, is broadcast on CBS, setting off a wave of inquiries about the studio and reawakening interest in the history of Warner Bros. Animation. A feature film, Bugs Bunny: Superstar, featuring interviews with Avery, Clampett, and Freleng, as well as a selection of pre-1948 cartoons and home movies of the old studio, is released in theaters. Narrated by Orson Welles, the film earns rave reviews. November 1976: Carnival of the Animals, directed by Chuck Jones and featuring the music of Camille Saint-Saens and the poetry of Ogden Nash, launches a series of half-hour compilation specials for prime-time broadcast. They are enthusiastically received by viewers. More than twenty similar specials are produced over the next fifteen years. September 29. The Bugs Bunny/Road Runner Movie (called "The Great American Chase"), a theatrical release of assembled clips from Chuck Jones's old Warner Bros. cartoons (and twenty minutes of new animation), is selected to open the 1979 New York Film Festival before being released nationally. Friz Freleng is named executive producer of the revived cartoon division at Warner Bros., a studio response to the steady interest in the animated characters. Filled with young, newly hired animators, the studio creates TV, theatrical, and commercial projects. November 20. Friz Freleng's Looney Looney Looney Bugs Bunny Movie is released. November 19. Bugs Bunny's 3rd Movie: 1001 Rabbit Tales, directed by Friz Freleng, is released. 1983 August 5. Daffy Duck's Movie: Fantastic Island, another Freleng production, is released. 1985 December 21. Bugs Bunny receives a star on the Hollywood Walk of Fame on Hollywood Boulevard. The ceremony is attended by Friz Freleng, Chuck Jones, Bugs, and hundreds of fans. April. Bugs Bunny (assisted by Tom Hanks) presents the Oscar for Best Animated Short Subject on the 1987 Academy Awards show. November 20. Warner Bros. Animation produces The Duxorcist, the first theatrical cartoon out of the studio in almost two decades. The short is directed by Greg Ford and Terry Lennon. September 23. Night of the Living Duck, a Daffy Duck theatrical short, premieres at the New York Film Festival. Directed by Ford and Lennon, it features Mel Torme voicing Daffy's singing in a nightclub lounge, along with Mel Blanc's last cartoon work. September 24. Daffy Duck's Quackbusters, a feature-length film directed by Ford and Lennon, is released. The film features a compilation of old footage and new animation. July. Mel Blanc, who provided a voice for the bulk of Warner Bros.' cartoon characters for more than fifty years, dies. September. "Steven Spielberg's Tiny Toon Adventures" debuts. The show features pint-sized pupils of the legendary Looney Tunes repertory company. Produced by Tom Ruegger and Jean MacCurdy for Warner's new television division, the show would be the first of several to gather twenty Emmy Awards (including Best Animated Series, Best Writing, and Best Music) for the animation studio. November 2. Box Office Bunny, directed by Darrell Van Citters, is the first Bugs Bunny big-screen short in twenty-six years. 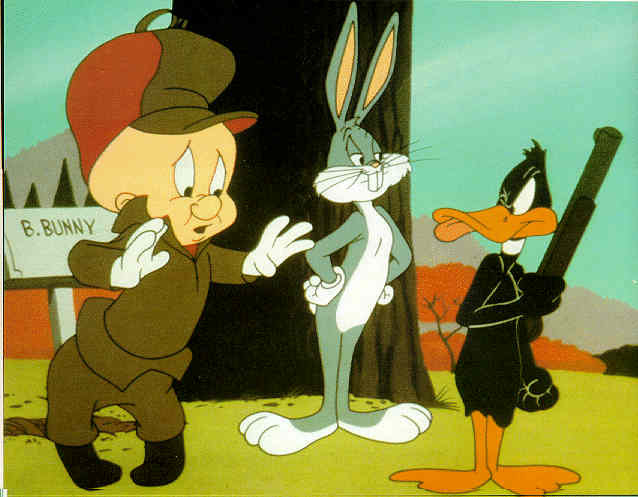 The cartoon co-stars Daffy Duck and Elmer Fudd, and is released to coincide with the year-long celebration of the 50th birthday of Bugs Bunny. Bugs again presents the Oscar for Best Animated Short Subject during the Academy Award ceremonies. Warner Bros. Animation produces "Taz-Mania," a half-hour series based on the daily life of the irrepressible Tasmanian Devil and his family. January. "Hare Jordan," the innovative Nike Super Bowl commercial starring Michael Jordan and Bugs Bunny, is telecast. It later wins numerous commercial awards, setting the stage for a theatrical teaming of Bugs and Jordan. August. Friz Freleng receives his star on the Hollywood Walk of Fame. October. "Batman: The Animated Series" makes its debut. Based on the style and characters of the original Bob Kane comics, the series is a hit with both kids and adult reviewers. September. "Steven Spielberg Presents Animaniacs" debuts on afternoon television. The series, headlined by Yakko, Wakko, and Dot Warner, is the most successful latter-day attempt to recapture the lunacy and satirical edge of the classic Warner Bros. cartoons. Other Animaniacs include Pinky and the Brain, the Goodfeathers, and Slappy Squirrel. The show will win numerous Emmys and a Peabody Award. November. Chariots of Fur, starring the Road Runner and the Coyote, is released. Directed by Chuck Jones. January 11. Michigan J. Frog and Chuck Jones throw the power switch to launch Warner Bros. new network, The WB. February. Chuck Jones receives a star on the Hollywood Walk of Fame. April. Once more, Bugs Bunny (this time assisted by Daffy Duck) presents an Oscar. August 25. Carrotblanca, a spoof of Casablanca, is released nationally. Directed by Doug McCarthy and assistant director Spike Brandt, the film stars a crowd of Looney Tunes characters. September. "Steven Spielberg Presents Pinky and the Brain" debuts in prime time on the fledgling Warner Bros. Television Network (promoted by mascot Michigan J. Frog as "The WB"). "The Sylvester and Tweety Mysteries" makes its debut on the Kids WB! on Saturday mornings, along with "Steven Spielberg Presents Freakazoid!" June. Warner Bros. Movie World in Bottrop, Germany premieres the landmark animated 3-D film Marvin Der Marsmench In Der Dritten Dimension (Marvin The Martian in the Third Dimension). The film is shown in New York at the studio's flagship studio store in October. September. "Superman," a new animated series, debuts on The WB. The series combines the visual styles of Warner Bros.' new "Batman" series and the classic Max Fleischer short subjects of the 1940s. Superior Duck, starring Daffy Duck, is released. Directed by Chuck Jones. November 15. Space Jam, the first feature-length film starring the Looney Tunes characters (with basketball legend Michael Jordan), is released. December. Warner Bros. Movie World in Oxenford-Gold Coast, Australia premieres the animated 3-D film "Marvin The Martian in the Third Dimension" to rave reviews making it one of the most visited attractions in the park.